I just caught this in my RSS feed. Seen on the EighthInch site. The updated flier makes things official. 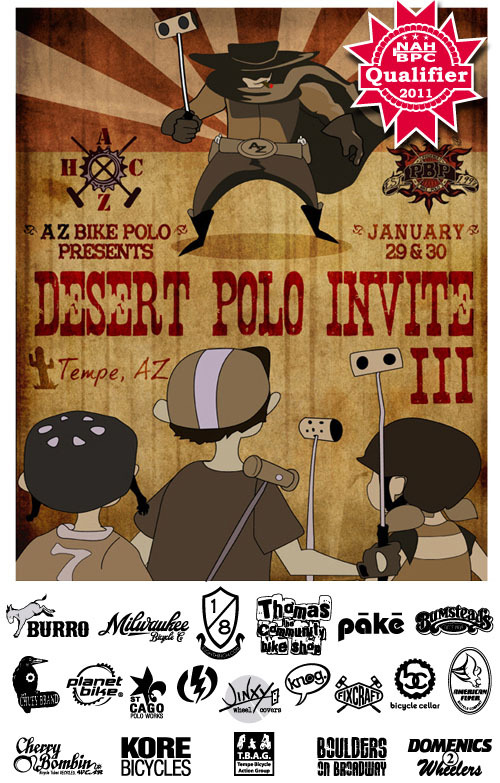 The Desert Polo Invite will be a qualifier for the North American Hardcourt Bike Polo Championships this year. The top 8 teams qualify automatically and will be able to register immediately for the NAHBPC. The 9-12 place finishers will be eligible to register immediately for the NAHBPC Wildcard Tourney. For more info on the tourney take a trip over to The League of Bike Polo. This entry was posted by Doug D on January 10, 2011 at 9:26 pm, and is filled under Bike Polo, Past Polo Events, United States. Follow any responses to this post through RSS 2.0. You can leave a response or trackback from your own site. thanks! yeah i should have signed the flier. didn’t think it would end up all over the internet universe.